Little Footsteps in the Big World: How long is too long? How long can one enjoy a holiday before wanting to be back to normal life? Some people enjoy traveling for months, or even for years. I never see myself being on of them. There's always a point of a holiday when I'm basically ready to head home. As I'm typing this, we -the kids and I- have been away from home for forty three days. In normal circumstances, when we'd be away for a vacation somewhere new, it probably would've been too long. But since we're in Indonesia, my home country, staying at my parents' place, it doesn't actually feel like we're away from home. We actually ARE home. However, our main problem is the separation between us -the kids and I- with my husband. He stayed with us for the first two weeks before heading back to Croatia for work. Although to day the toddler still says she'd prefer staying here in Indonesia to going back to Croatia, I know it's now enough for her. Not the trip itself, but being away from her dad. Our newborn adapted quite well. She didn't have any health problems, until the day her dad left. She caught a cold right after his departure, had fever for a few days which calmed down by itself. Then she got severe diaper rash -which she never had so far-, and her cold came back with a cough. Despite me cleaning her nose with a nasal spray constantly, the mucus got into her ears and she got her left ear infected. My baby, who usually sleeps through the night with one breastfeeding-in-sleep at around 2am, didn't sleep for two nights. On the second night secretion came out from her left ear and she cried immediately -out of pain- the moment I touched her left ear gently. We took her to the ER at 3am, where she was briefly checked by the physician and referred to the pediatrician. Having her diagnosed with ear infection caused by common cold, the pediatrician referred her to the otolaryngologist who prescribed her with some ear drops, while the pediatrician treats her cold. Today, she's fine. She has completely healed and she sleeps through the night again. Whether her sickness is connected with the absence of her dad? I don't know. Maybe not. But it also would've been much easier for me to handle the situation if only we were all together. In three days we're heading to Zagreb where we'll all be reunited. My toddler still doesn't want to go home. 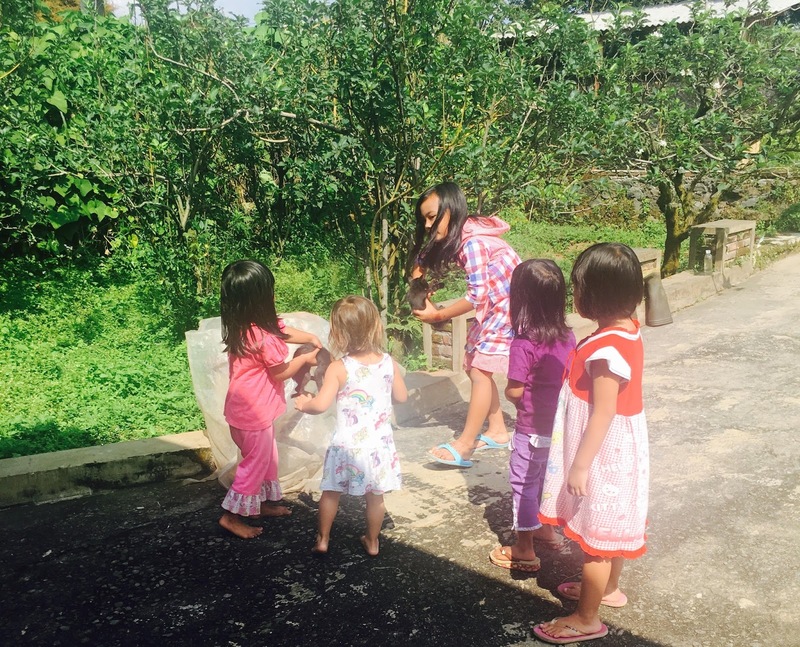 She's now at the neighbor's place playing with the local kids. She'll be missing my parents a lot. But I know we're ready to head home. We'd had such a wonderful time here with my big family that we're ready to reunite our little family. Before you know it, we'll be back here. Very soon.